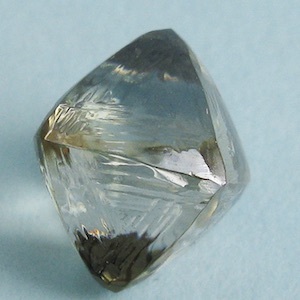 A Russian gem lab recently spotted a rough synthetic moissanite coated with a thin diamond film (pictured) and warned that coated simulants could prove “challenging to identify,” according to an article in the winter 2018 edition of the Gemological Institute of America publication Gems & Gemology. The transparent yellow octahedron was submitted as a rough diamond to the Far East Geological Institute, the note said. But while tests for thermal conductivity indicated the stone was a diamond, tests for electrical conductivity, commonly used to identify synthetic moissanite, weren’t as conclusive: Some areas of the stone, primarily its edges, indicated it was a diamond, but its smooth face and dimples pointed to synthetic moissanite. A look at the stone through a gemological microscope revealed it had no inclusions typically associated with natural diamonds. 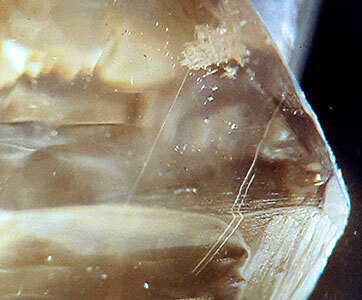 Instead, it contained only small, parallel needlelike inclusions, a characteristic of synthetic moissanite. The 5.35 ct. rough crystal evidenced needlelike inclusions, which are characteristic of synthetic moissanite and not a natural diamond. The full note can be seen here. The Gems & Gemology piece was credited to Vera Pakhomova, Dmitrii Fedoseev, Svetlana Kultenko, Alexander Karabtsov, Vitaliia Tishkina, and Valentina Solyanik, all with the Far East Geological Institute, as well as Vladimir Kamynin, who works with Russia’s Gokhan. The Far East Geological Institute could not be reached for comment.